The Dairyman's Blog: Cows, grass, old tractors, etc. Cows, grass, old tractors, etc. As March draws to a close, the grass continues to grow, and my father and I have less out-of-town meetings to attend, the activity on our farm should really start picking up. That's not to say we've just been sitting around the last few weeks, because there's always something to be doing on a dairy farm. We've continued to have good springtime weather over these past few weeks, and as a result our cows have been grazing nearly every morning. We're still working on cross-fencing one of the pastures that they will begin to access later this week, and I've already applied a light dose of nitrogen fertilizer to some of the grazed ground. The cows' milk production has leveled off after the initial increase that came along with the start of their grazing, and they should be able to maintain that production until late morning heat becomes an issue. In other farm news, our spring harvest will probably begin in two weeks. Weather will certainly play a role in whether or not it's fully ready by then, but we wouldn't mind starting even if it's a tad bit early since it will likely take us two weeks to complete the harvest. Our plan is to chop the majority of it, but we will likely try to bale and wrap a few acres worth as well. Finally, we said goodbye to an old friend this past week. 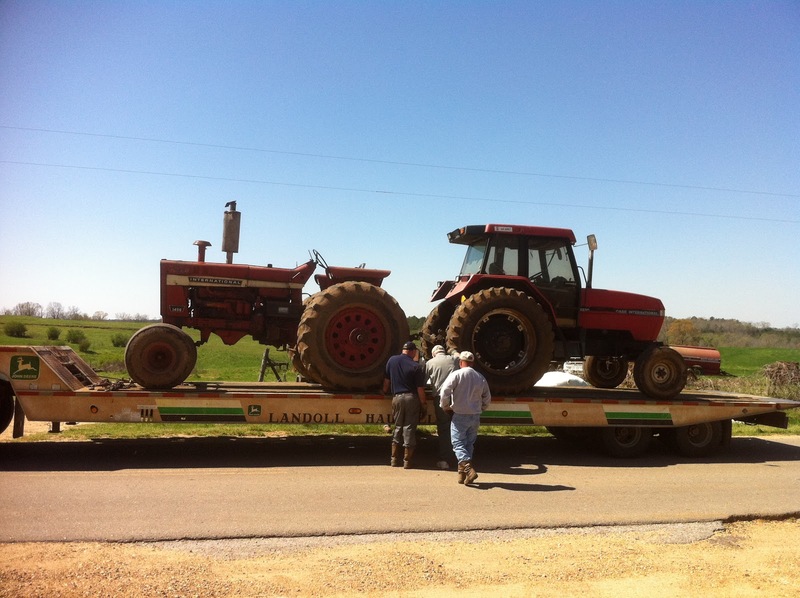 My grandfather's old IH 1456 tractor was traded off along with our Case 5230 for a '97 model John Deere 7810. Ol' Red had served us since my grandfather gave her to us about 12 years ago, but she was just one heavy load away from needing to have the engine rebuilt for the second time in three years. With neither it nor the Case able to reliably handle our feeding wagon, we decided we should swap them out in favor of a larger tractor with more horsepower. Even though we needed to make a change, I'll certainly miss Ol' Red. Say it ain't so, Will! You are tradin' off those red ones for green ones? I will give you a pass since it's business. I wish I had some newer tractors here too. My 5230 (fwa) is still in pretty good shape. My old Farmalls have seen better days though! You boys sure do get attached to your tractors. Steve's in love with his old utility and the 4020 (JD). I feel for you because I have seen that sad look here at our farm. I posted about the Cycle of Life at our farm and talked about machinery. We have some new sprinkled in with the old, but they all get treated with TLC. @Paul - We try not to judge a tractor by the color of its paint, but of the horsepower at its PTO. That being said, our experience has been that the greens require less maintenance than the reds as they start racking up a lot of hours. @Lana - Do you know why we really get attached to old tractors? They're paid for! Looking pretty green around here!